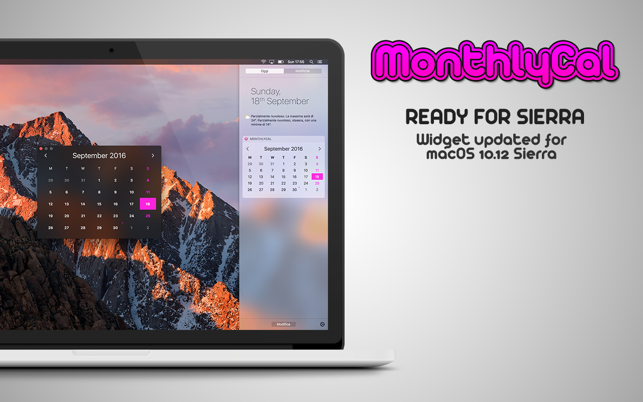 MonthlyCal is a beautiful and colorful monthly calendar widget for OS X Yosemite. MonthlyCal supports gregorian's calendar and it is almost localized in every language! With the new version you can click on a day to show the list of related events. Click on an event to show it in OS X Calendar app! - Click on a day to show the list of events! - Click on an event to show it in OS X Calendar app or Fantastical™ 2! - Weekdays are localized in every language. - Support for Sunday or Monday as first weekday. - ENABLE WIDGET: Open Notification Center => Click Edit Button => Add MonthlyCal. 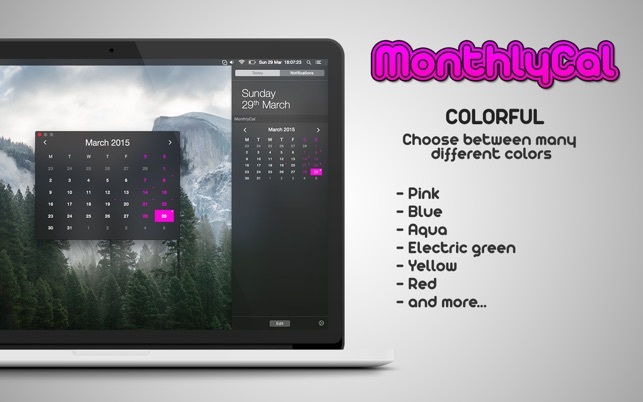 - THEME COLOR: Open main app => Open Preferences => Choose your color. - EVENTS INDICATOR: Open main app => Open Preferences => Check "Show events indicator" => Allow MonthlyCal to access to your calendars. If "Show events indicator" is checked but you doesn't see any indicator (A little dot on days with one or more events) open "OS X System Preferences" => Click "Security and Privacy" => Choose "Privacy" tab => Click "Calendar" => Flag "MonthlyCal".